We love berries in this house! Any we can get our hands upon, Blueberries, Raspberries, Strawberries, Huckleberries… if Berry is in the name, we are likely to have it stuck in a jar somewhere. 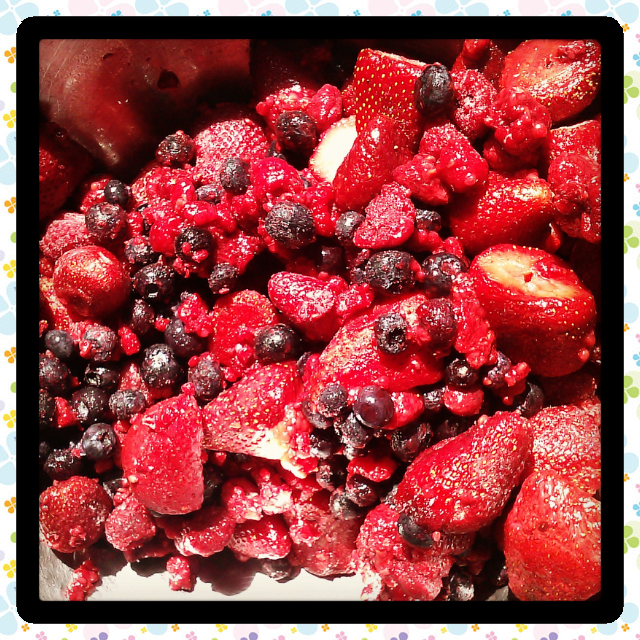 One of the great things about berries is you can intermix recipes easily to get a variety of flavors! Here is the makings of a razzleberry jam! Berries are such a frugal way to perk up your pantry! When they come on sale, watch for the deals at your local growers markets, from grocery stores (I found organic raspberries for 1.00 a pound at a local big box store!) or from the wild (wild blackberries!). When you have these stuck back on your pantry shelf, they give a fun surprise for the middle of February when everything is dark and grey! Sure beats paying the high cost at the grocery store that time of year too! I love to have frozen berries and nothing could be simpler! Frozen berries are perfect for a smoothie, just combine with milk and a frozen banana, a dollop of yogurt and honey, blend and happy children ensue! Toss that into a popsicle mold and children are even more happy! When freezing berries, just rinse them well, lay them on a single layer on a baking sheet and freeze. Once solidly frozen, slide these right into freezer bags and into the freezer they go. You can remove however many you need at a time. Berries are also just as wonderful dehydrated! I have an Excalibur 9 tray, the granddaddy of dehydrators and it will dehydrate them in no time. Most berries can be placed right onto the trays, blueberries need to be blanched first OR frozen! There you go! Pop your frozen berries onto dehydrator trays and soon you have dehydrated berries perfect for granola, hot cereal or to get baked into muffins! 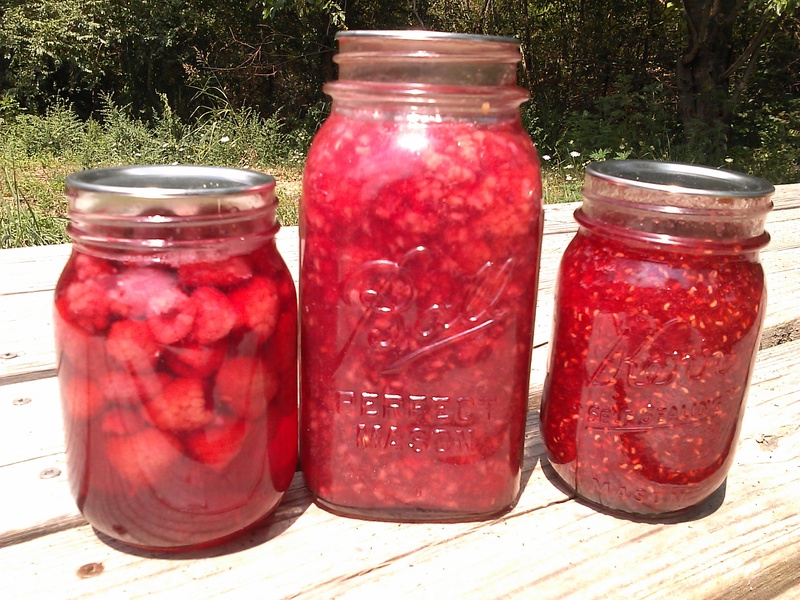 When it comes to canning, some berries hold up better then others. I love to make strawberry preserves and jam, and they are heavenly sliced and dehydrated but I am not a fan of the texture of them canned. Raspberries, blackberries, blueberries, and huckleberries hold up well when preserved. Raspberries are very delicate and will fall apart somewhat, but they are still delicious over ice cream! You can hot pack or cold pack berries. We cold pack because it is quicker and we have not noticed a significant difference in the jars. First, Mix your syrup. You can use whatever you like but a light syrup of 5 3/4 cups water to 1 3/4 cups sugar is a mixture that won’t overwhelm the berry. Set this to simmer, then fill 1/2 cup in the bottom of your jars. 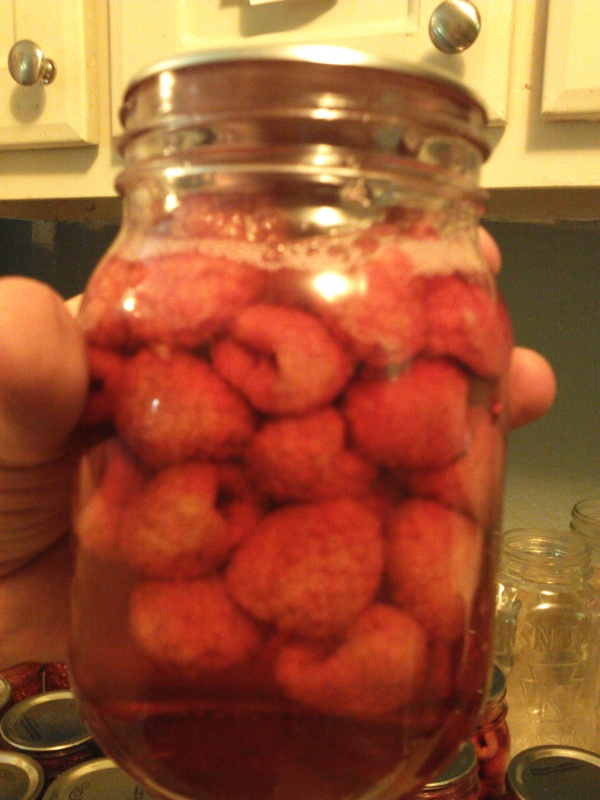 Fill jars with berries and cover with remaining syrup. Make sure you release all air bubbles as there usually is quite a bit! Wipe rims, cap with 1/2 inch headspace and process in BWB 15 minutes for pints and 20 minutes for quarts. Simple! If it is syrup for pancakes, ice cream sundays or to drizzle over a cake you are wanting, then here is a great blueberry syrup recipe! You could substitute other berries for the blueberry and have similar results. Mix berries, water and sugar. Bring to boil, boil 5 minutes. Add lemon juice, zest and cinnamon. If you want a smooth syrup, you can strain through a strainer or cheesecloth. We prefer ours with fruit, so I mash with a potato masher, leaving about half of the fruit whole. Fill your hot pint jars with syrup, wipe rims, cap with 1/2 inch headspace and process in BWB for 15 minutes. This is delicious! Blueberry syrup! Amazing over ice cream or pancakes! We keep a few jars of this available. I actually prefer to thicken my filling when I make the pie, but it is handy to have this when you want to make pie, turnovers, tarts or pipe into cupcakes! This makes for a frugal and fun treat! Often in the winter when kids have been stuck in the house for days I will break out a jar of something summery and fun, let the kids make their own crusts and bake them, it breaks the monotony and gives a little sparkle of summer! The important thing to remember is that you are not able to use flour or cornstarch in canning. I know that everybody used to do this but the NCHFP (National Centers for Home Food Preservation) says this is a no-no. If they say its not ok, well I listen. Part of this is due to safety and heat penetration but also part is quality as these products break down. Instead you need to use Clear Jel. You can buy this online at several locations. I personally am very concerned about GMO’s in my home, and since one of the top GMO produces is corn (which is what Clear Jel is made from) I choose to buy a non GMO version called Cornaby’s. I found mine at Amazon. Have a good time with the berries! You do have a lot! We did about 35 pounds of them this year!!! 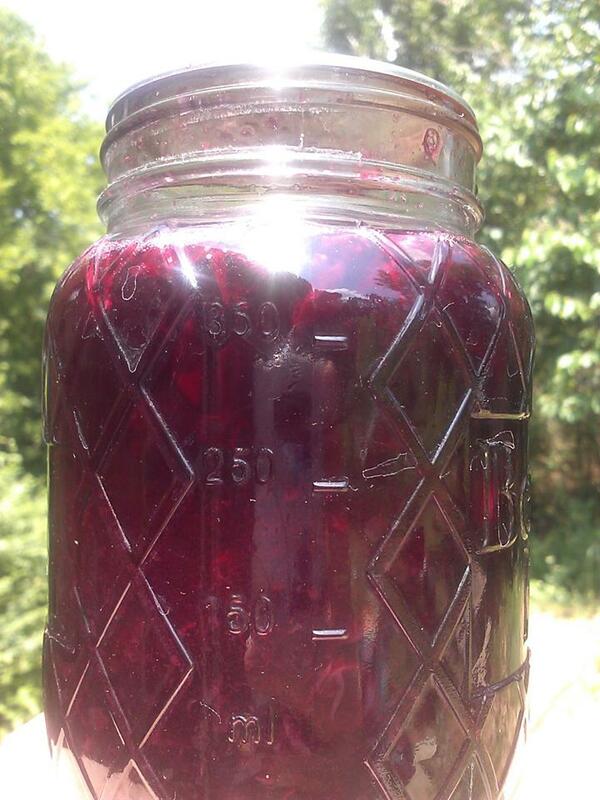 Preparing and preserving whole foods in frugal and safe fashion! Jumping into blogland to share ways of preserving and preparing the harvest, whether you harvest from the grocery store or your backyard! I am a mama of many, with five children (three at home) and foster children (numbers vary at any time) and a full time career, I depend on simple whole foods, preserving through canning, freezing and dehydrating to keep a frugal and realistic budget. This isn't a fancy blog, I am too busy chasing lego eating toddlers and science minded adolescents blowing up the kitchen ... er... experimenting... to be fancy. Pull up a chair, grab some coffee and lets chat! Keeping track of what we preserved this year. Starting with Julys I did not track before. August and September were consumed with moving 2300 miles away! Cranberry Jalapeno Jam! Yes Please! Say it isn’t so Sweet Potato!! Beans, Beans, Good F… on Soup Day!